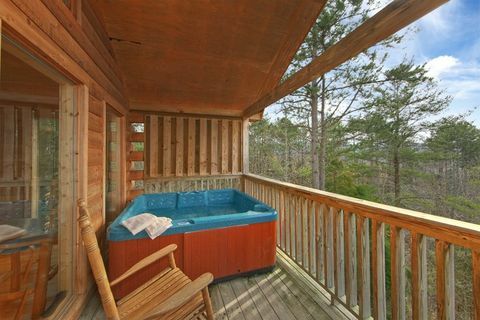 Escape to this gorgeous Pigeon Forge honeymoon cabin for a most memorable stay in the beautiful Tennessee Smokies. 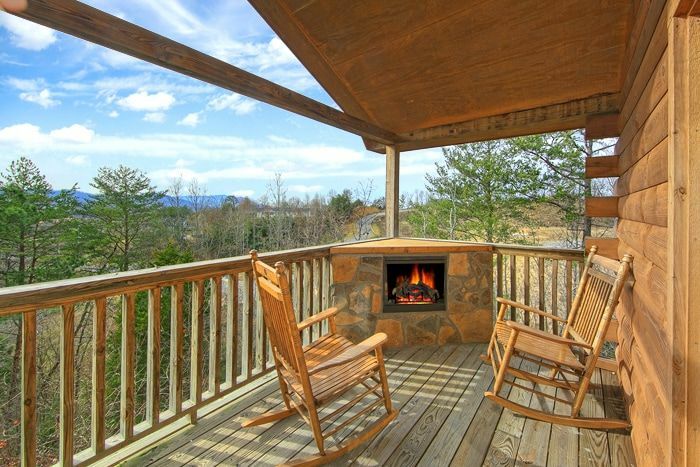 Imagine the two of you relaxing on the porch in the hot tub, soaking in the warm, soothing water as you both watch a spectacular sunset over the Smokies, your faces aglow from the warm flames of your outdoor fireplace. 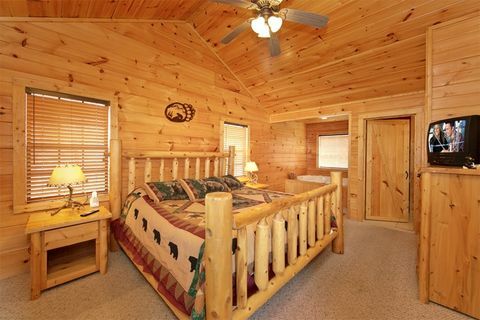 "Bear Tracks" provides couples with a romantic, cozy one-bedroom Pigeon Forge honeymoon cabin on Upper Middle Creek, placing you close to Dollywood and the action-packed Pigeon Forge Parkway. Honeymoon couples find this cabin to be the perfect getaway for alone-time while still offering easy access to many of the area's biggest attractions, including Gatlinburg's Glades Arts and Crafts Community where you can find unique handmade souvenirs. 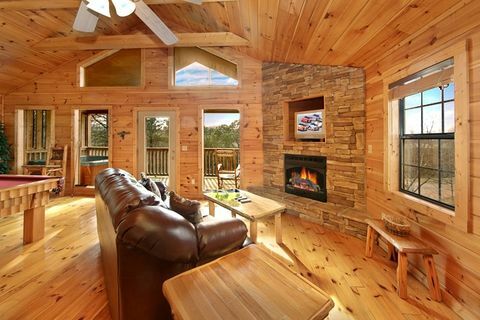 This Pigeon Forge cabin also features a floor to ceiling stacked stone fireplace in the spacious living room. 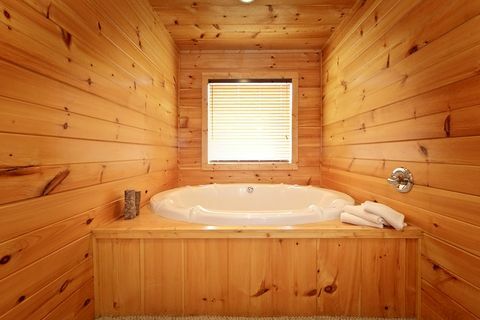 The bedroom provides a relaxing quilt covered king size log bed, private jacuzzi bath for two, and television for a relaxing mountain retreat. 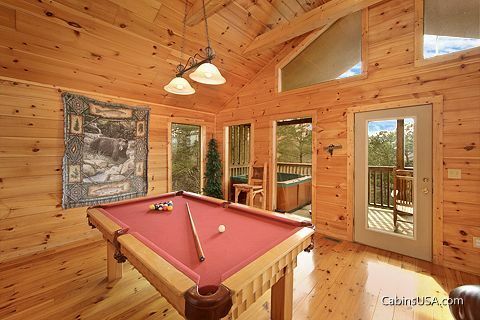 The WiFi Internet access throughout the cabin and full-size pool table provide additional entertainment. Cook a romantic A night spent cuddling with your sweetheart by the outdoor fireplace turns an ordinary honeymoon to an extraordinary one! 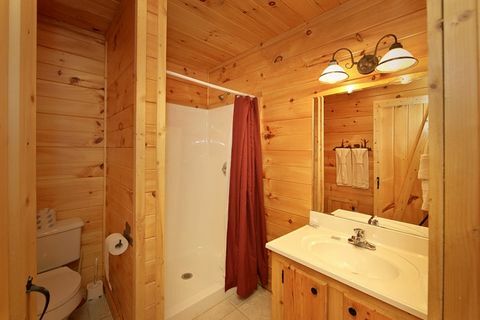 When searching for cabin rentals in Pigeon Forge, be sure to remember Cabins USA has hand-picked every Pigeon Forge honeymoon cabin to meet your needs and desires. 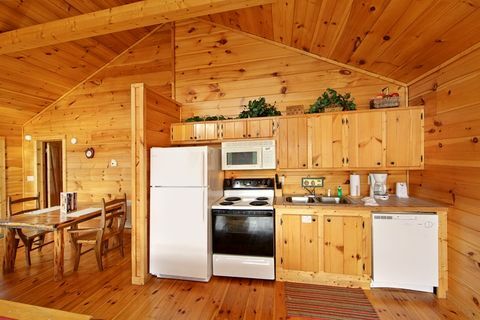 When you book "Bear Tracks", receive an immediate Online Cabin Discount to make your honeymoon vacation even more affordable.